Fridays are made of WIN. To that end, and because I haven't done it for a while, I thought I'd compile a little list of things that have delighted me this week. I've got a ridiculously busy weekend ahead and won't be around much so I hope you all have a good one! Things with my initial on. 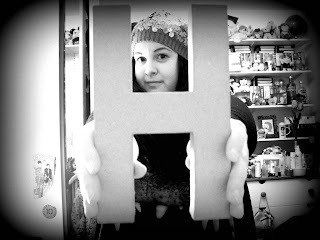 I love the letter H. Its symmetry pleases me. Necklaces, bags, big cardboard letters (see above). Sleep Talkin' Man. It's the blog that everyone (well, a lot of people anyway) is talking about. An English man who talks in his sleep. His American wife who records it and then posts about it. Hilarious. My particular favourite is "Big pig. Massive oink. Little curly tail", for obvious reasons. C used to talk in his sleep, much to my delight, although not on quite the same scale as STM. I've forgotten a lot of the things he said (should have written them down, darn it) but one that sticks in my mind is "Wake me up after the ceremony, but before the pudding." Occasionally we'd have conversations where he'd fall asleep in the middle and discourse (I always think that word looks rude, always) would take a surreal diversion. I kind of miss it. A lot. Nancy & Betty. Their cards are gorgeous and I just want to buy them all. Alas I need to seriously curtail my spending for the time being as I have exciting things to save for. The wikipedia page for Bears, particularly the terminology part. I particularly like Sleepy Bear and Otter. Literally incredible. I ♥ Boxie. Lovely lovely t-shirts that have stories, sometimes heartbreaking, behind them. Can you guess which one I own? Other miscellaneous things include, but are not limited to... Mr Scruff's Big Chill tea - rooibos, pear and cinnamon. Yum! // my Dad's lack of stomach cancer, obviously // laughing at perverts who post comments on my Flickr photos // Covent Garden minestrone soup and Vogel's soya and linseed bread for lunch // tickets to see Passion Pit in March <3 // The Body Shop passionfruit body butter. I love to smell like fruit // the snow thawing, finally!